For adventurous players, nothing can be better than a bunch of new online casinos waiting for them to try each and every one. · Spurs v West Ham Preview - This is a football stadium, Hammers! There is a certain symmetry about this meeting with West Ham. 20 years ago this week, the "Hammers" visited White Hart Lane on 24th April, 1999. It was the day that Bill Nicholson Way was named and the great man was present for the ceremony and even paraded on the White Hart Lane pitch with some of his old chums and former players. Sadly, West Ham spoiled our day and won the game 2-1. · When travelling to America for sporting events, an Esta USA is essential for your journey. Get an 888sport free bet and use it on their wide range off football and sports betting markets. · You can now play mobile bingo for free and bingoformobile.co.uk is top of the league when it comes to no deposit offers. Play gambling games online at live dealer casino with best croupiers in the UK. · Spurs 1 Brighton 0 - Eriksen breaks the deadlock! · Spurs v Brighton Preview - Time to make a fortress in our new home! 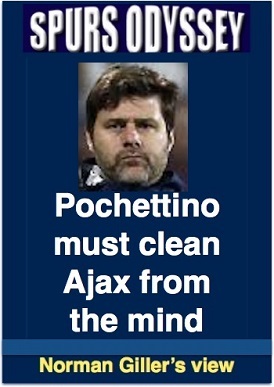 Somehow, Mauricio Pochettino must morph into a sort of Svengali and erase all thoughts of the Champions’ League semi-final against Ajax from the minds of his players. He has to convince them that the next two Premier League matches are the most important fixtures of the season. · See Norman Giller's latest article in full. 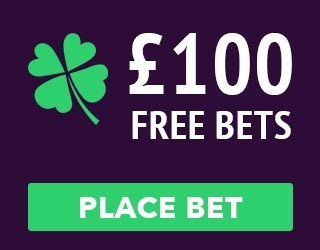 · Spurs fans in Ireland who like a bet visit irishfreebet.com first for some free bets. · Manchester City 1 Spurs 0 - The game plan was excellent - execution not so good. · Manchester City 4 Spurs 3 - Ecstasy at The Etihad! · Manchester City v Spurs Preview - Make it a massive night Spurs! · Spurs 1 Manchester City 0 - We dared and we did! · Spurs v Manchester City Preview - Bring on the 12th man! · Chelsea U-18s 0 Spurs U-18s 2 - Spurs take title race to last day! · Read Ray Lo's latest report. · Spurs 4 Huddersfield 0 - Moura! Moura! Moura! · Spurs v Huddersfield Preview - Spurs need to regain third place! The most epic thread on The Spurs Odyssey message board is one which started in 2010. This provides the history of our new stadium applications (including the thankfully unsuccessful bid for the Olympic Stadium) right up to the present day with images of the completed new stadium. In the early hours of Saturday 20th October, 2018, our stadium thread reached 1,000 pages! There is a genuine community feel about the board, which is moderated. Every Spurs match is covered with excellent threads, which feature images and stats from previous games. There is so much to enjoy about the message board which also has an off-topic section where non-football matters are discussed. Perhaps you are more interested in games than a message board. You might like to look at this Bingo sites comparison. The Spurs Odyssey message board will still be waiting for you! Looking for an entertainment from the comfort of your own sofa? We recommend free online slots and best UK slot sites published on rewarded multiple times ReadySlotsGo portal. Experience 3D, HD graphics with Virtual Reality games and be the first to try it out! Sign up at bet365 with your-promotional-code.co.uk. Binary options trading? Check out 7 Binary Options. Have a look at these Casinos for British players here. All material on the Spurs Odyssey website is � 1997-2018 Paul Smith unless otherwise stated.